With a new year comes new updates for PolygraphPro Suite Version 4.2 which comes with many enhanced features that you will want to get your hands on! We’ve given a face life to the FrontEnd, ChartRecorder, ChartViewer, and QuestionEditor+. Some of our favorite new features that we know you will enjoy include customizable score sheets, auto question set advancing, and customizable scratch pads. 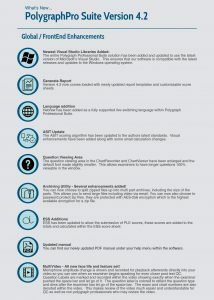 For a full list of these NEW features and benefits built just for you, download our infographic! Not covered under the Total Care Warranty and want to get your hands on this update? Click HERE.